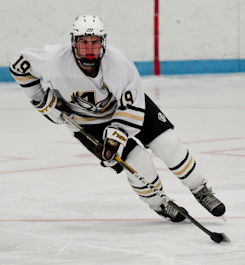 Apple Valley coach Jerry Hayes split up star forwards Hudson Fasching and A.J. Michaelson on separate lines this year, but he still expected great things from them. 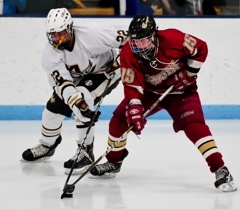 Hayes got great things from his standouts during the 3-2 victory over Lakeville South on Tuesday, Feb. 15, at the Apple Valley Sports Arena. The two underclassmen had big games as Michaelson scored on a power play opportunity and Fasching tallied the game-winner with less than three minutes remaining in the third period. 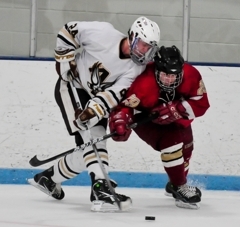 After carrying the puck deep into the Lakeville South zone Fasching battled his way into scoring position and slid the puck past Cougars’ goaltender Brady Frahm. “It was the greatest moment,” Fasching said. “I was so happy. I wanted to score so bad. I can’t remember the last time I scored to be honest. I was thinking about that before the game and then I was like ‘Oh, finally’ cause I’ve been trying so hard. (Coach Hayes) told me a couple days before that I had to relax, just play my game and I’d be fine. As it turns out, Hayes wasn’t the only coach impressed with Fasching’s effort. Perhaps no one in the Apple Valley Sports Arena was more excited to see Fasching’s go-ahead goal than Eagles’ goaltender Aaron Gretz. Fasching also played a role with an assist on Michaelson’s power-play goal which capped some impressive passing with a quick wrist shot that found the top right corner of the net. Gretz made 29 saves in his last regular season home game with Apple Valley but also had the best seat in the house watching Fasching and Michaelson step up. “They’re unreal,” Gretz said. “You don’t even notice they’re underclassmen, you think that they’re seniors. They’ve been solid for us all year. They’re going to be great once they get older. 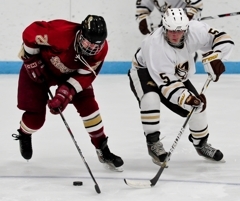 The last time Apple Valley and Lakeville South met back on Saturday, Jan. 15, the Cougars emerged victorious with a 5-2 win. Although the Eagles admit the game was not a fluke, they know what was to blame during the loss. Hayes’ players echoed his logic including Eagles junior forward A.J. Michaelson. 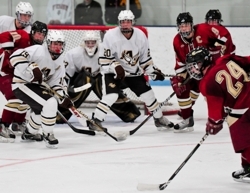 The Eagles did just that scoring the first goal and stepping up in critical points during the game which was played on ‘Senior Night’ that recognized Apple Valley’s senior class – Kris Goodman, Michael Berens and Gretz. “On Senior Night there are distractions,” Hayes said. “You got kids who are saying goodbye after a lot of these guys have a lifetime of memories growing up here so it’s tough for them to focus with their parents here and everything. Apple Valley is hoping its recent success will follow them as the regular season comes to an end and into playoffs. Not to be forgotten on the ice at Apple Valley Sports Arena was Class 2A scoring leader – Lakeville South’s Justin Kloos. The junior forward has 76 points (34 goals, 42 assists) in 23 games this season for the Cougars. 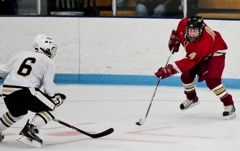 Four of those points (two goals, two assists) came during Lakeville South’s last game against Apple Valley on Saturday, Jan. 15. Thanks to watching tape from their last game against Kloos and the Cougars, the Eagles made sure to keep Kloos in their game plan. Lakeville South coach Kurt Weber knows the talent he has at his disposal. “We ride on his back as you can see,” Weber said. “He’s a game changer. He missed the net a couple times tonight but he comes up hard. Everybody’s watching him. To his credit, he continues to work extremely hard. He’s extremely intelligent on the ice. He’s not big but he’s got all the other gifts and he makes up for (his lack of size). He generates a lot of offense and he’s a good team leader. Kloos definitely drew the attention of Hayes during the Tuesday, Feb. 15, game as well. “The first thing (about Kloos) is, it’s the ‘Shaquille O'Neal mentality’ – you can’t control him, you just hope to contain him – but thankfully he’s not Shaq cause that would really make things ugly,” Hayes said. “He’s a heck of a hockey player. The nice thing about him is that he’s so unselfish. You really see that. He looks for other people, he finds the quiet spots, he uses his speed extremely well. He’s fun to coach against cause it’s a challenge for your team. I’d like to think A.J. and Hudson have a similar challenge for other teams during their game planning cause they’re pretty dynamic in their own right. 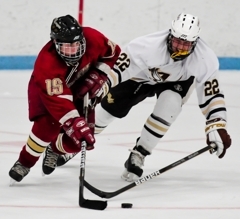 The 3-2 loss to Apple Valley on Tuesday, Feb. 15 may not have been what Lakeville South was hoping for, however the Cougars still feel they are in a good position heading into the final game of the season. Lakeville South outshot Apple Valley 31-28 including a flurry of shots during the last 1:51 in the third period after pulling goaltender Brady Frahm for an extra skater. The Cougars close out the regular season with another South Suburban matchup at Apple Valley Sports Arena. 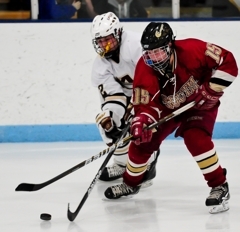 This time – on Thursday, Feb. 17 – Lakeville South will faceoff against Eastview. Hudson Fasching and A.J. 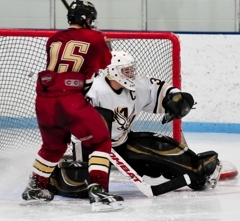 Michaelson each had a goal and an assist and Aaron Gretz made 29 saves as Apple Valley squeaked out a 3-2 victory over Lakeville South on Tuesday, Feb. 15, at Apple Valley Sports Arena. Fashing notched the game-winner with 2:41 left in the third period and also assisted on Michaelson's game-tying goal which came on a power-play opportunity. Lakeville South's Justin Kloos provided an assist on both of the Cougars' goals that were scored by Alex Harvey and Calvin Boecker. 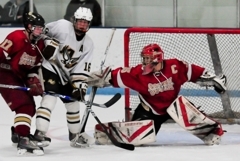 Brady Frahm made 25 saves for Lakeville South. Both teams close out the regular season on the road on Thursday, Feb. 17, with South Suburban play. Lakeville South heads back to Apple Valley Sports Arena to take on Eastview and Apple Valley will faceoff against Lakeville North at Ames Arena. 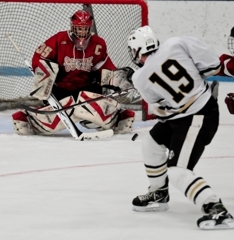 After being held out of the goal scoring column for five games, Fasching snuck a shot past Lakeville South goaltender Brady Frahm in the third period for the game-winning goal. The sophomore forward also assisted on A.J. Michaelson's power-play goal. 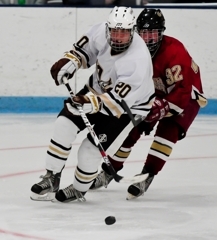 Michaelson commanded the attention of Lakeville South whenever the junior forward was on the ice. Michaelson assisted on the game's opening goal and scored a pretty power-play goal that found the top right corner of the net. Despite not scoring a goal Kloos played a factor in both of his team's goals registering an assist on each score. The junior forward received extra attention from Apple Valley defenders and the Class 2A scoring leader still managed to find the score sheet.